We’d love your help. 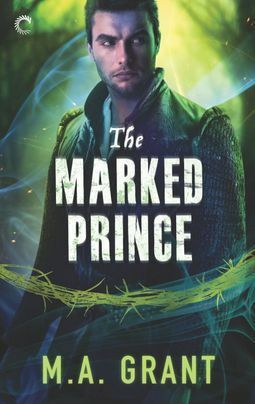 Let us know what’s wrong with this preview of The Marked Prince by M.A. Grant. Torn between two worlds, desperate to save one love. The Summer Court is nothing like Sebastian remembers. The oppressed lower classes are drained of their magick, and around every corner political intrigues threaten an already unstable regime. Sebastian’s only hope of surviving the Court and bringing home Prince Lyne’s traitorous brother lies with Duine, a magickless Unsee Torn between two worlds, desperate to save one love. The Summer Court is nothing like Sebastian remembers. The oppressed lower classes are drained of their magick, and around every corner political intrigues threaten an already unstable regime. Sebastian’s only hope of surviving the Court and bringing home Prince Lyne’s traitorous brother lies with Duine, a magickless Unseelie servant desperate to win his freedom. A servant for whom Sebastian, an estranged Seelie royal himself, is developing a dangerous and deepening affection. But behind the mask Duine wears are secrets as dangerous as what’s smoldering between them. And the more Duine helps Sebastian navigate Court life, the more it becomes clear the servant is not who he appears to be. How he came to be the whipping boy of one of the most powerful and corrupt faeries in the Summer Court is a truth Sebastian is determined to uncover, even if it puts him at odds with the very people who can lead him to the missing Unseelie prince. When a powerful enemy steps from the shadows, it could spell the end not just for the Unseelie, but for both faerie Courts. Sebastian must choose: complete the mission and earn his place among the Unseelie who took him in, or risk his very life to ensure freedom for the man he loves. To ask other readers questions about The Marked Prince, please sign up. I hope the cover is just as gorgeous as the first! If you've read PAD, you know I tend to write a little dark. As THE DARKEST COURT series continues and the civil war breaks out fully, the books don't shy away from that darkness, so I figured it might help to give a head's up here on some of the content warnings in THE MARKED PRINCE. I also want to specify that these are the warnings that instantly pop to my mind; I'm sorry for others I miss, and appreciate reviewers who do include them so the reading experience can be enjoyable for everyone. 4/1/19 - WE HAVE A COVER AND IT’S GLORIOUS!